5 Common ratios Mortality rate: Number of deaths per unit of population (10,000 or 100,000) Infant Mortality Rate: deaths among children < 1 year old total number of children < 1 year. 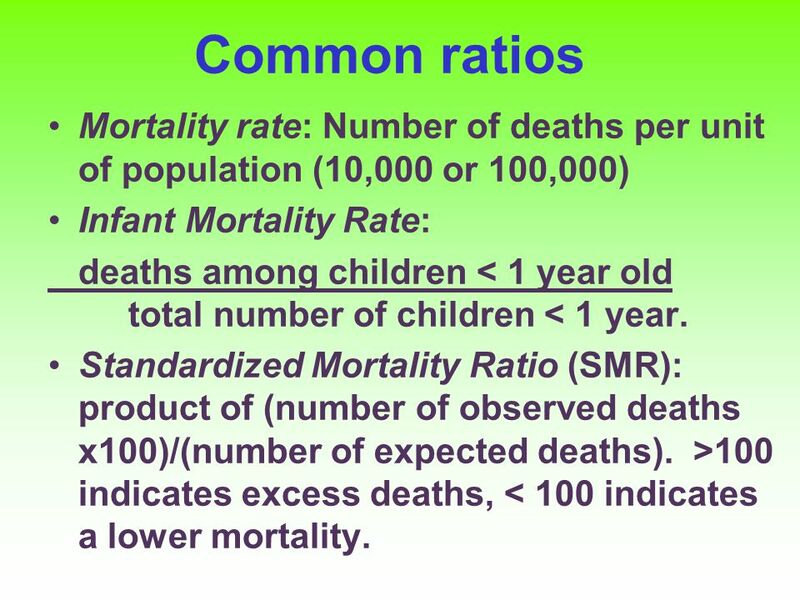 Standardized Mortality Ratio (SMR): product of (number of observed deaths x100)/(number of expected deaths). >100 indicates excess deaths, < 100 indicates a lower mortality. 6 Leading causes of death, HK. 11 Questions 1. 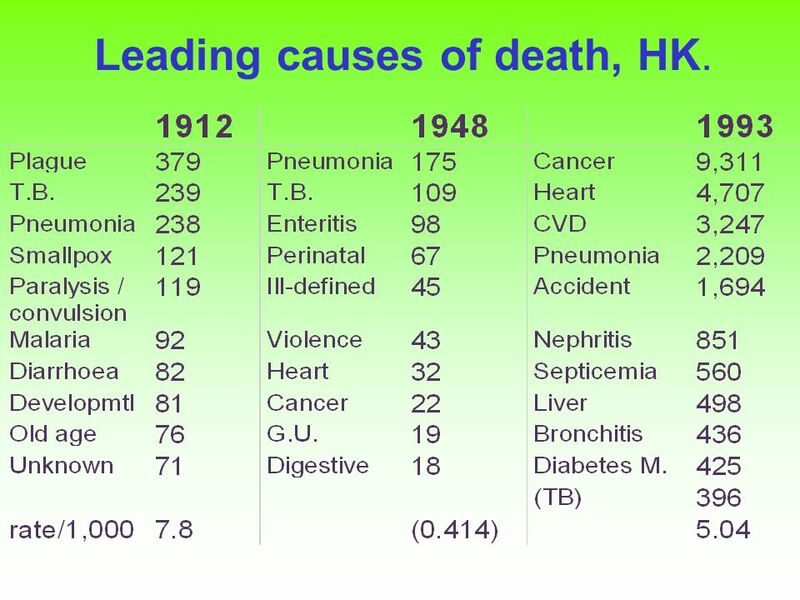 How has mortality changed in HK since 1900? 2. Why have these changes occurred? 3. 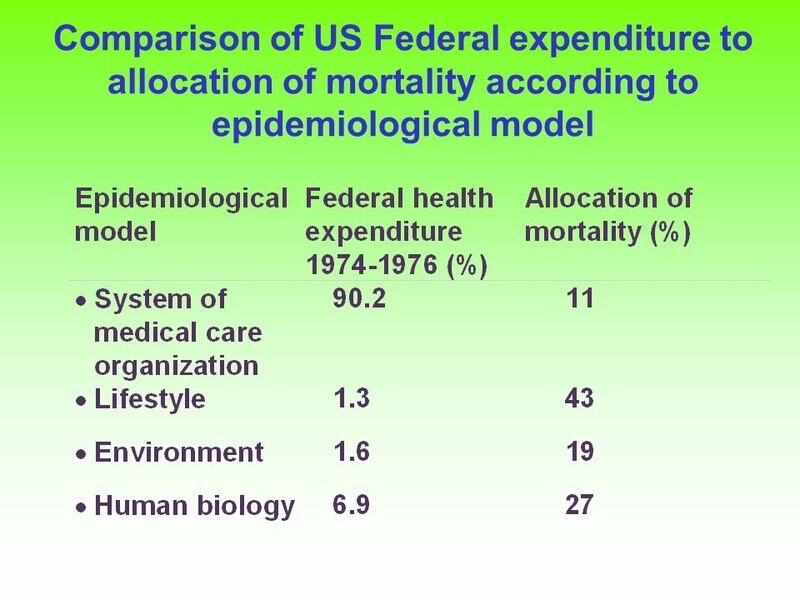 What does this tell us about the important influences on mortality? 4. 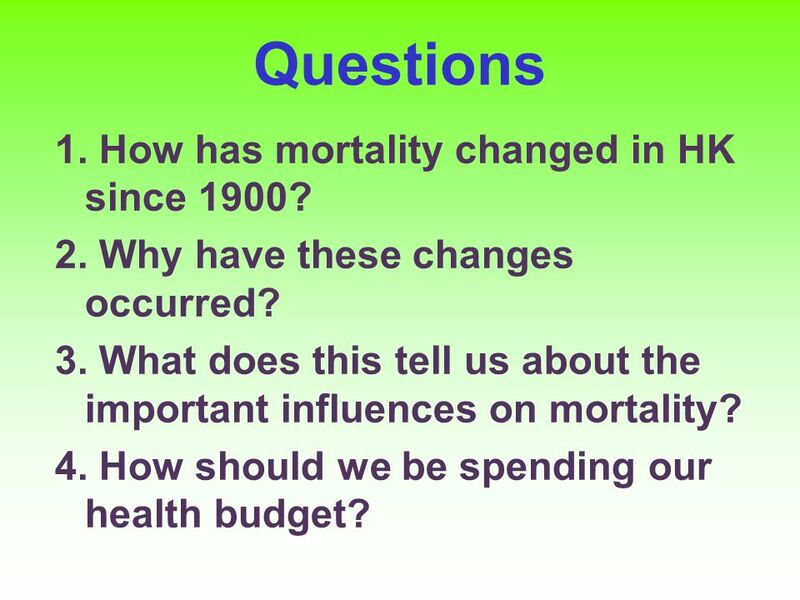 How should we be spending our health budget? 12 1. 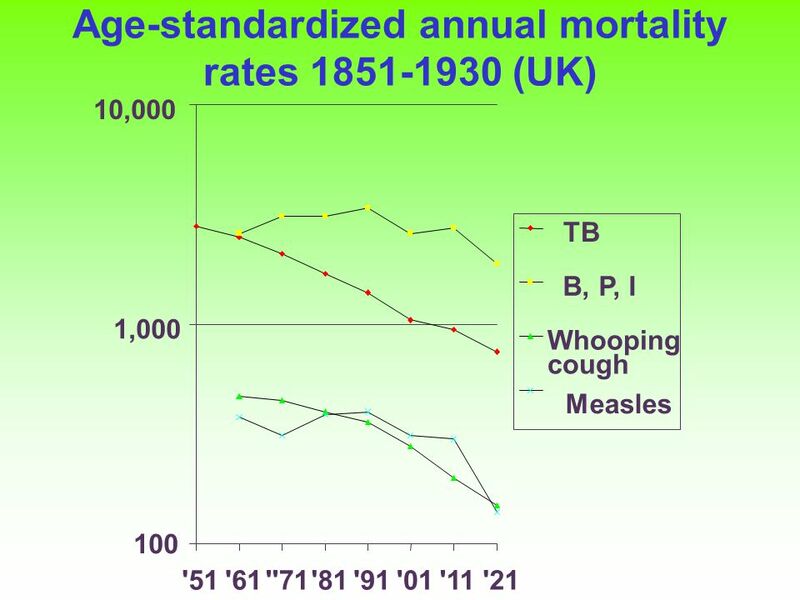 How has the pattern of mortality changed? 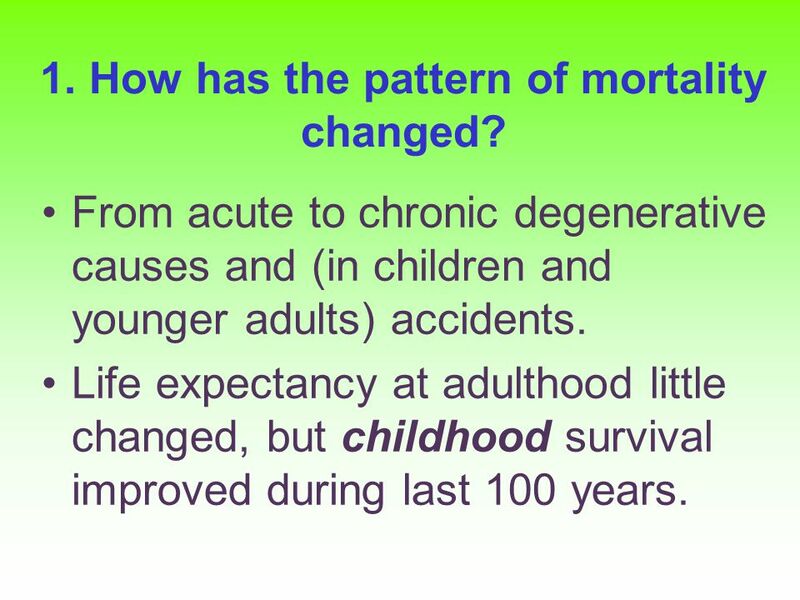 From acute to chronic degenerative causes and (in children and younger adults) accidents. 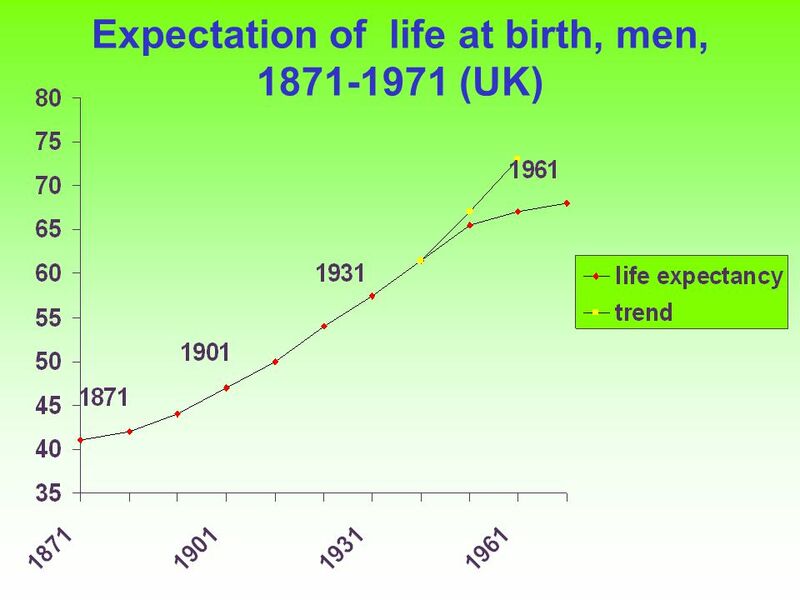 Life expectancy at adulthood little changed, but childhood survival improved during last 100 years. 13 How has mortality changed? (cont.) 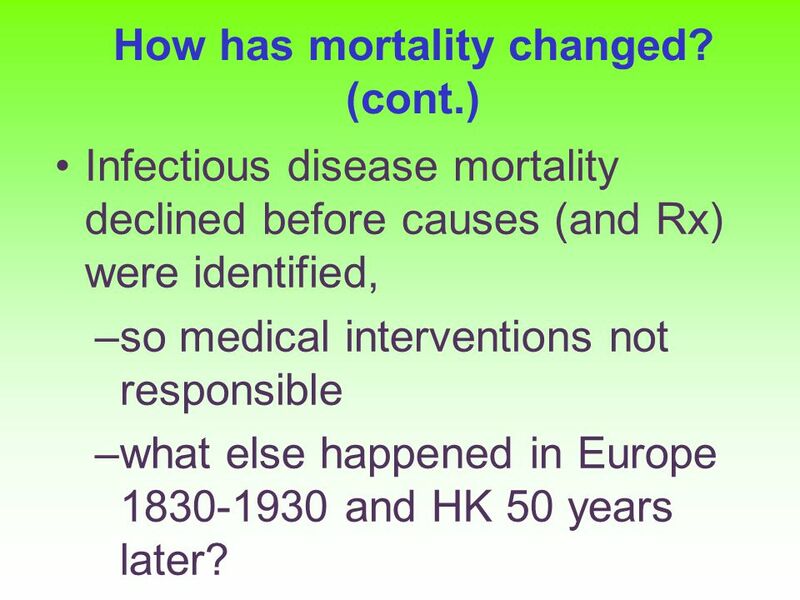 Infectious disease mortality declined before causes (and Rx) were identified, –so medical interventions not responsible –what else happened in Europe 1830-1930 and HK 50 years later? 15 2. 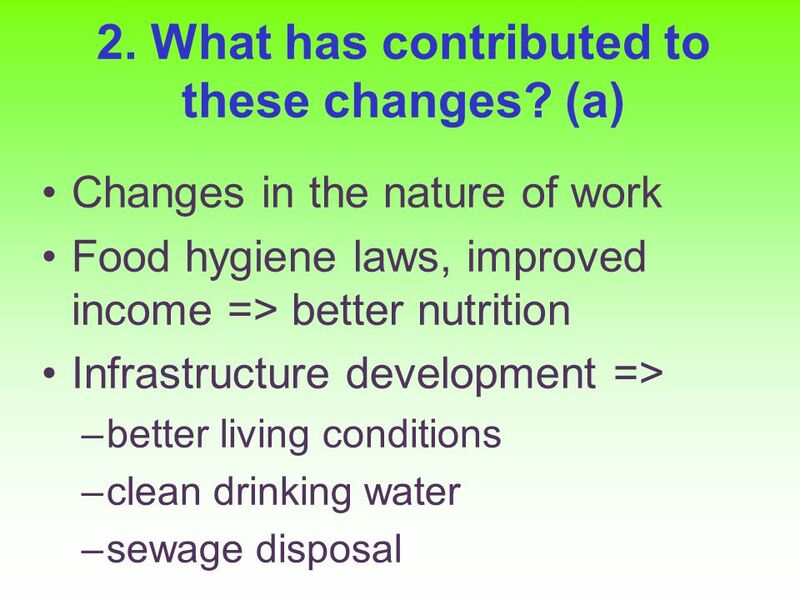 What has contributed to these changes? 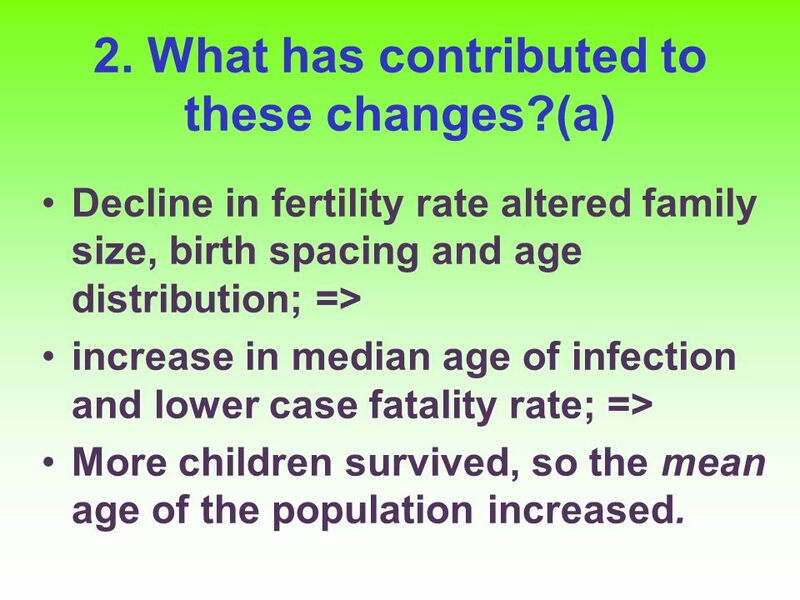 (a) Decline in fertility rate altered family size, birth spacing and age distribution; => increase in median age of infection and lower case fatality rate; => More children survived, so the mean age of the population increased. 19 2. What has contributed to these changes? 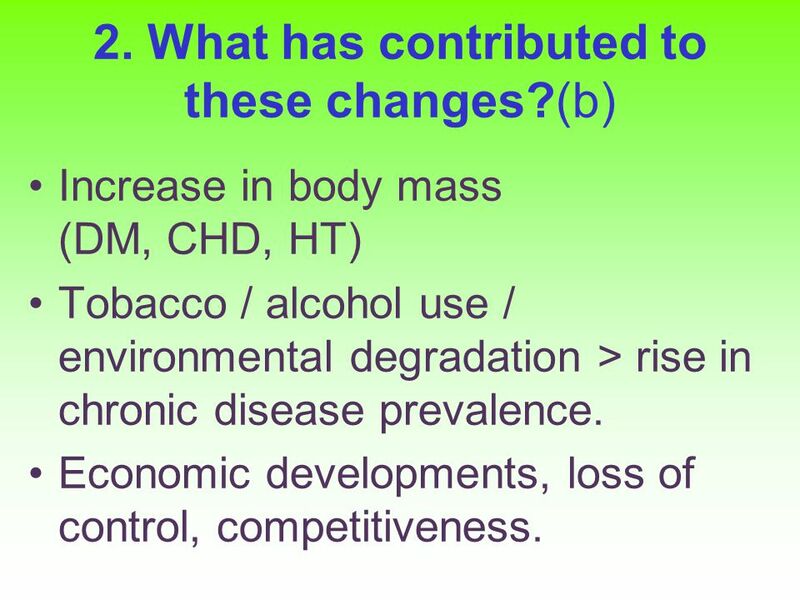 (b) Increase in body mass (DM, CHD, HT) Tobacco / alcohol use / environmental degradation > rise in chronic disease prevalence. 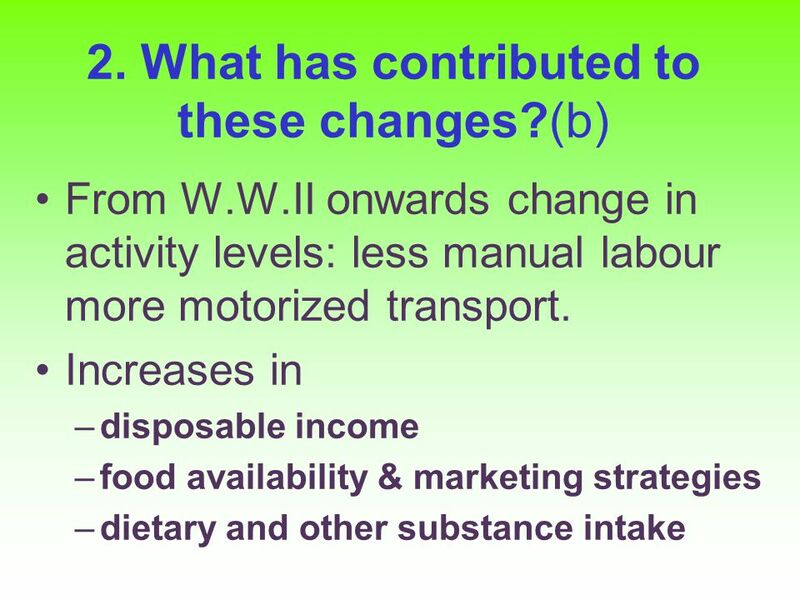 Economic developments, loss of control, competitiveness. 20 3. 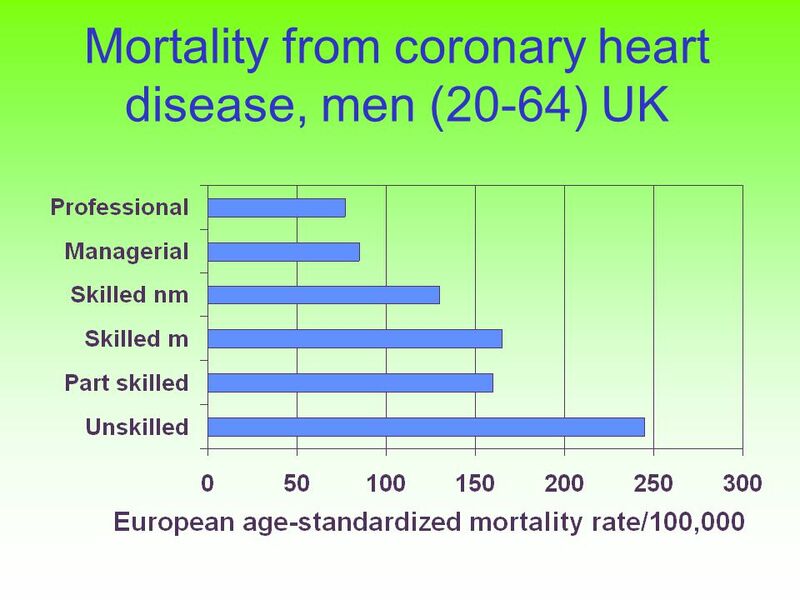 What does this tell us about important influences on mortality? 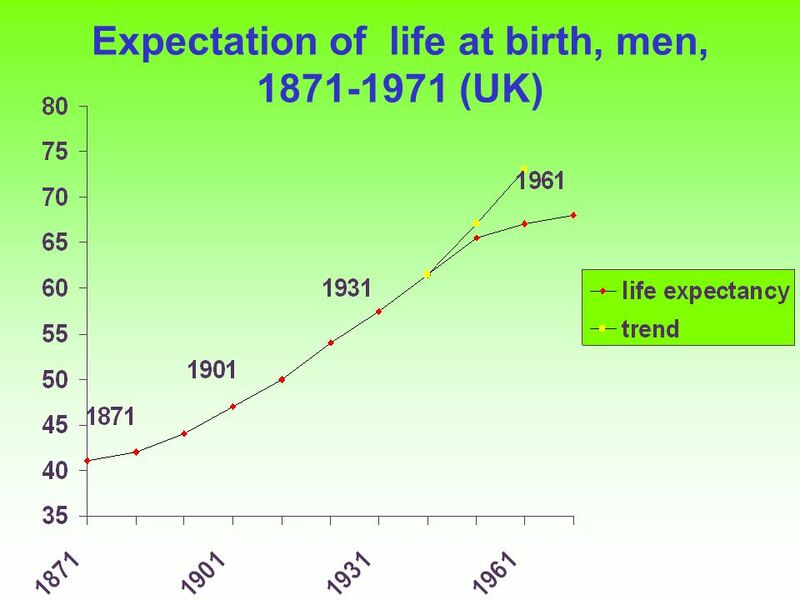 Improvements in life expectancy small despite massive expenditure on health care delivery. 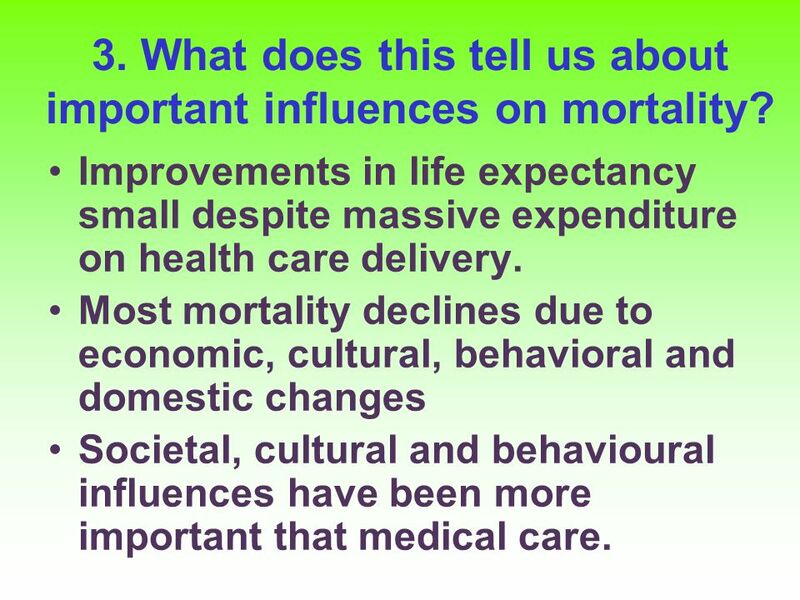 Most mortality declines due to economic, cultural, behavioral and domestic changes Societal, cultural and behavioural influences have been more important that medical care. 21 4. 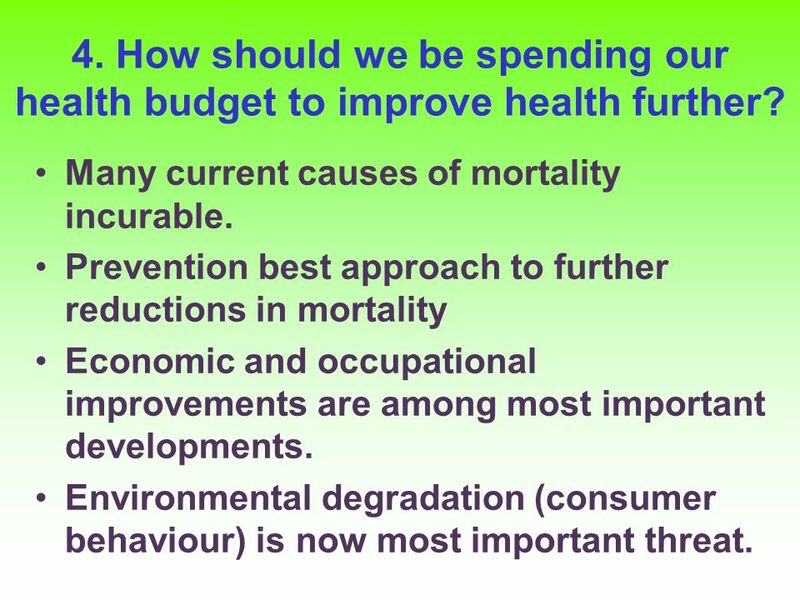 How should we be spending our health budget to improve health further? 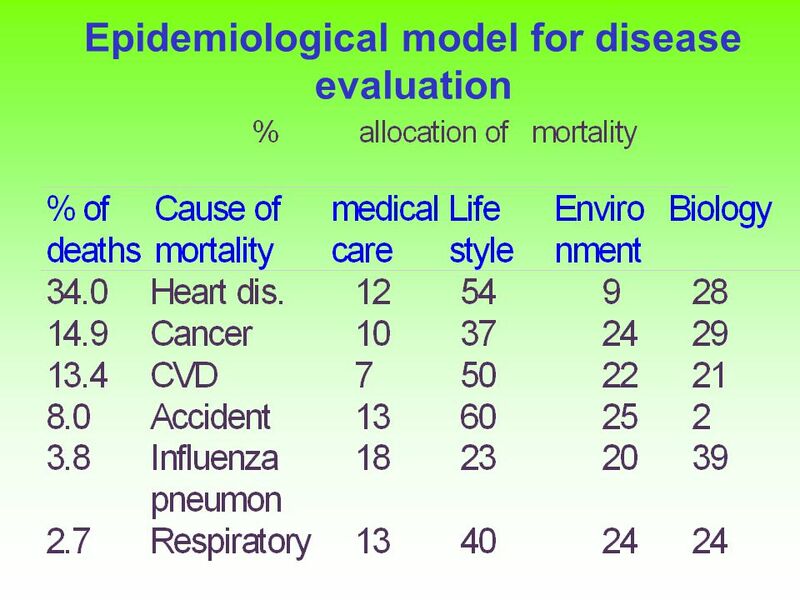 Many current causes of mortality incurable. Prevention best approach to further reductions in mortality Economic and occupational improvements are among most important developments. Environmental degradation (consumer behaviour) is now most important threat. 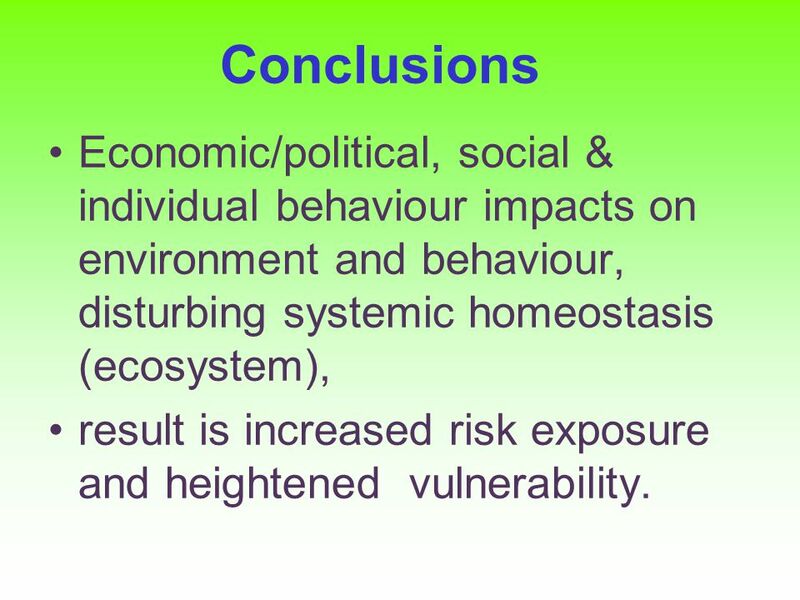 24 Conclusions Economic/political, social & individual behaviour impacts on environment and behaviour, disturbing systemic homeostasis (ecosystem), result is increased risk exposure and heightened vulnerability. 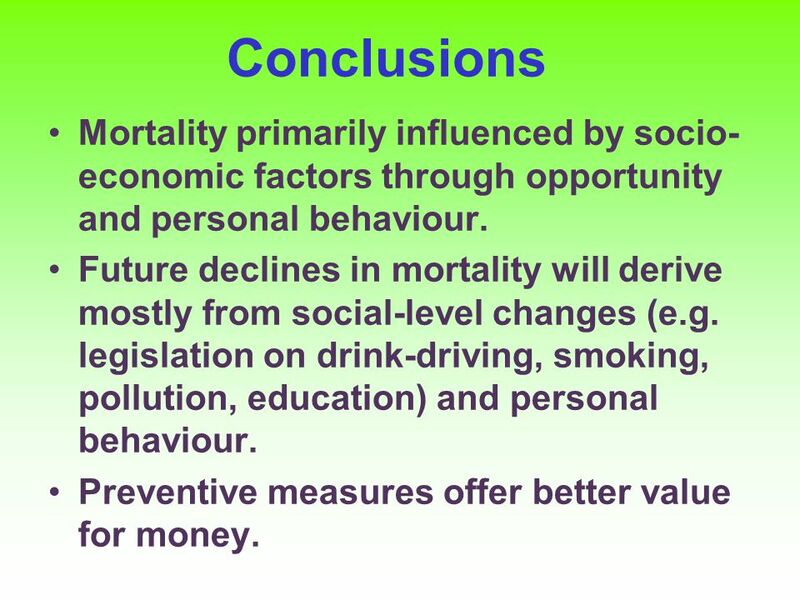 25 Conclusions Mortality primarily influenced by socio- economic factors through opportunity and personal behaviour. 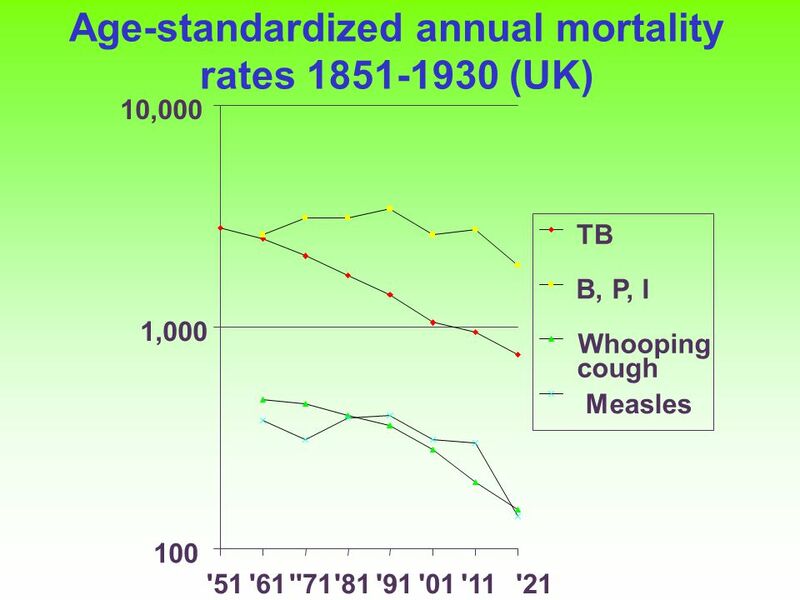 Future declines in mortality will derive mostly from social-level changes (e.g. legislation on drink-driving, smoking, pollution, education) and personal behaviour. Preventive measures offer better value for money. Download ppt "What kills us? 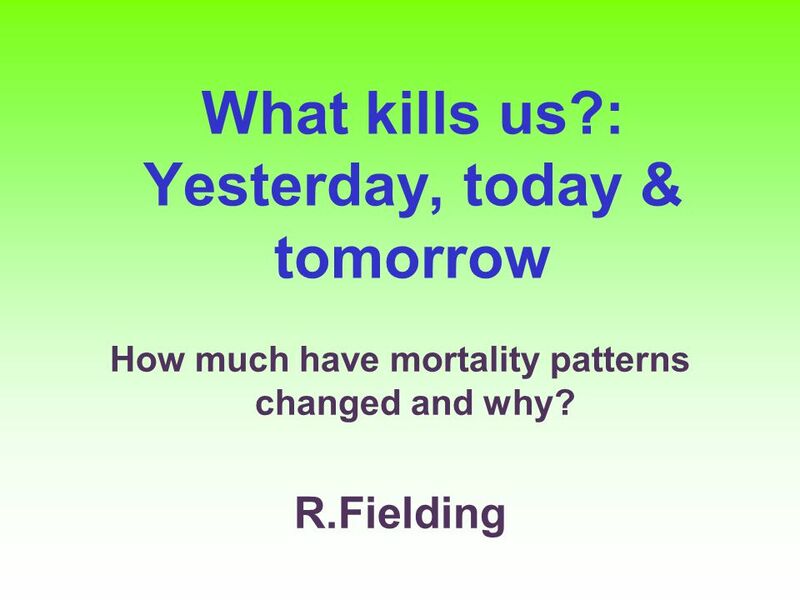 : Yesterday, today & tomorrow How much have mortality patterns changed and why? R.Fielding." Infant Mortality: Annual number of children under 1 year of age who die per 1,000 live births Under 5 Mortality/5 yr Child Survival Life Expectancy at. The Nutrition Transition Program The University of North Carolina at Chapel Hill Popkin, Public Health Nutrition, Feb 2002 THE NUTRITION TRANSITION AND. Inequalities in Health: Lifestyle Factors. Chap 8: Adolescents, Young Adults, and Adults Instructor’s Name Semester, 200_. 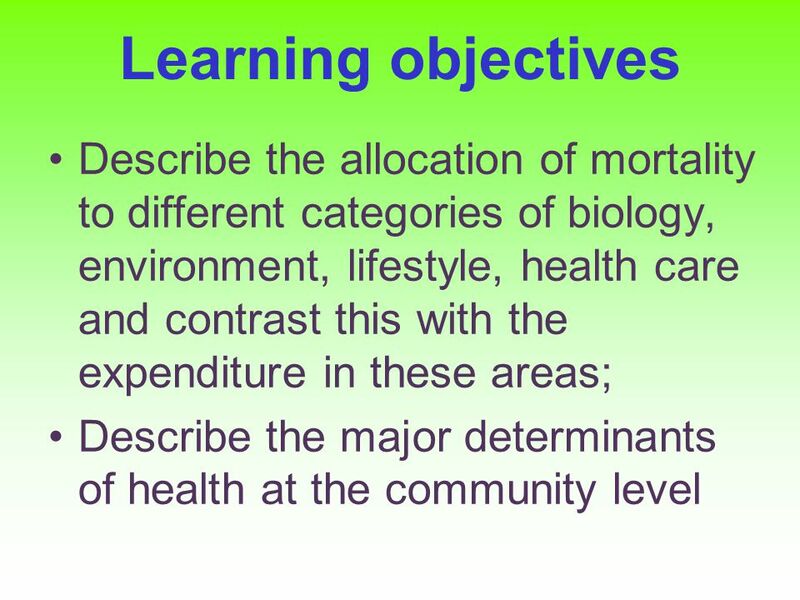 Chapter Objectives Define maternal, infant, and child health. Health indicators. 2 Absolute indicators ( indices ) :. 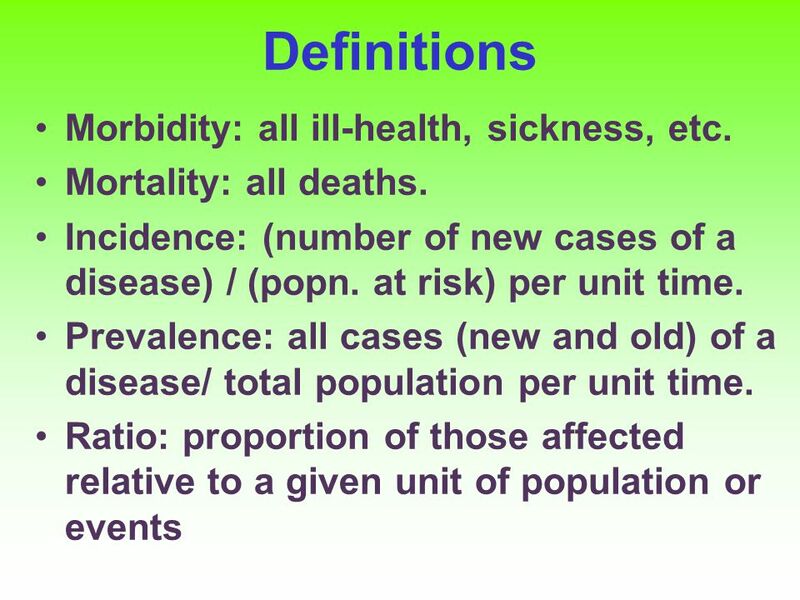 A ) Morbidity statistics B ) Mortality statistics C )Population ( annual ) growth rate Relative. Coronary Heart Disease (CHD): A Disease of Affluence. 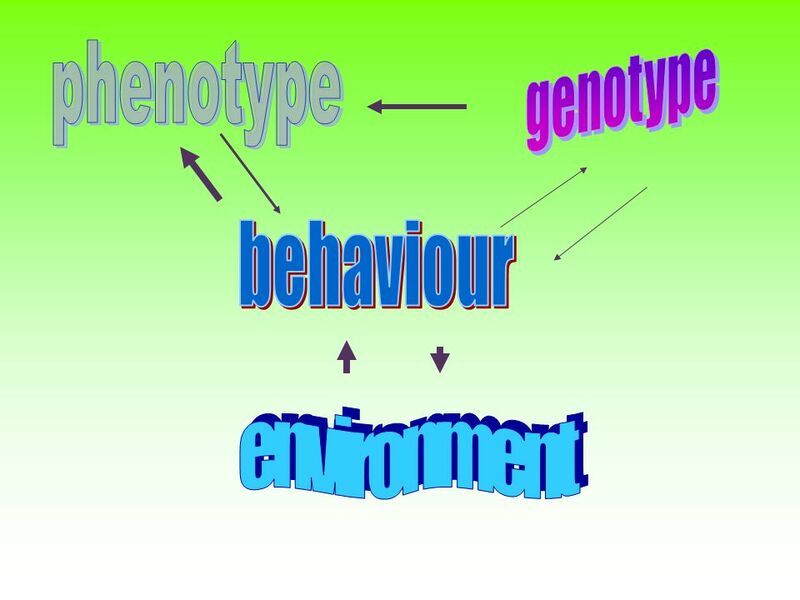 HEAPHY 1 & 2 DIAGNOSTIC James HAYES Fri 30 th Aug 2013 Session 2 / Talk 4 11:33 – 12:00 ABSTRACT To estimate population attributable risks for modifiable. Public Health and Prevention M6920 September 18, 2001. KINE 4565 Social class and injury. This week The broad determinants of health The relationship between injury and socio- economic status Student presentations.